4. any other substance or device has been used by a person on any limb of a horse or a person has engaged in a practice involving a horse, and, as a result of such application, infliction, injection, use, or practice, such horse suffers, or can reasonably be expected to suffer, physical pain or distress, inflammation, or lameness when walking, trotting, or otherwise moving, except that such term does not include such an application, infliction, injection, use, or practice in connection with the therapeutic treatment of a horse by or under the supervision of a person licensed to practice veterinary medicine in the State in which such treatment was given. 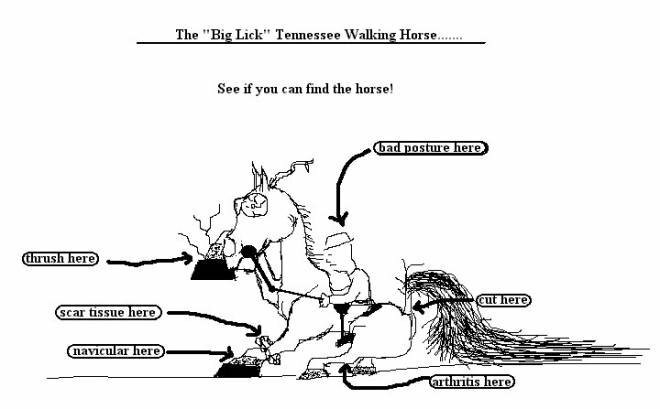 “Big Lick” performance Tennessee Walking Horse. The stacks look similar to platform shoes. Stacks started to become popular in Tennessee in the early 1970’s as more and more show horse trainers became attracted to the gaits produced by stacks. This led to the common use of stacks. Stacks were sometimes made of mostly leather and were much heavier than most used today, which are usually made of rubber and/or plastic. 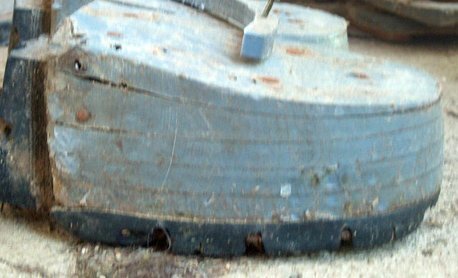 Some stacks were also made hollow, and were able to be filled with substances such as lead, and wet sand to make the stacks heavier, forcing the horse to use more strength to lift its legs. Most stacks today are solid and not filled although they are far from harmless and require bands to keep them attached. owners want (high, quick steps) which is considered desirable by these owners, trainers, and show judges. as the hoof tries to grow past the restrictions of the band or from the band wearing a slot in the hoof. 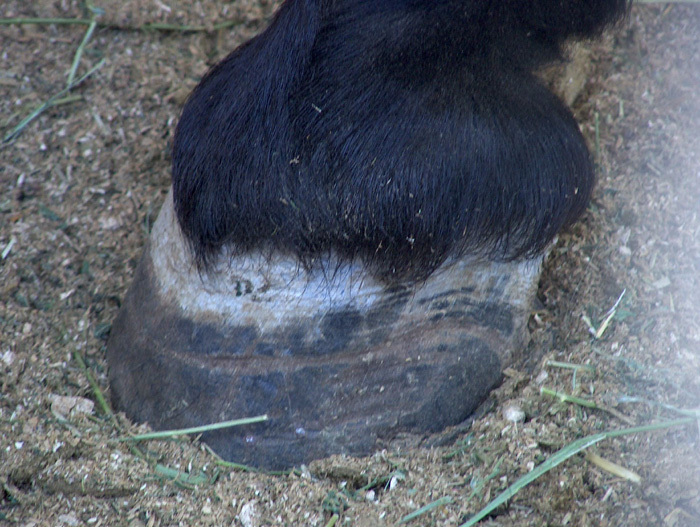 Below we see a curious groove in the hooves as well as in the picture at the above right. Chains are another training device that "enhance" the gait of a horse. Manufactured, bracelet-type chains can be bought through tacks stores, horse supply magazines, and other sources. These store bought chains, weighing up to 10 oz. 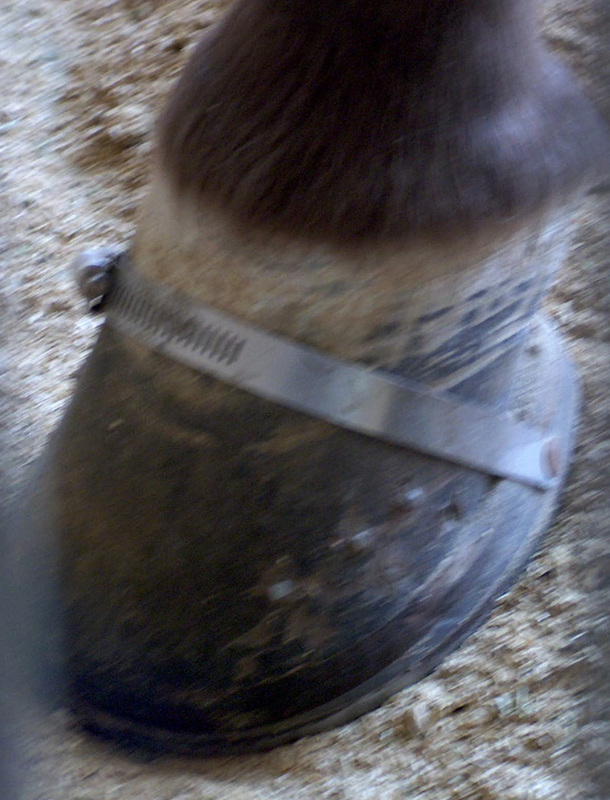 legally (although chains that violate weight limits are still sold and used) are placed around the front pasterns/ lower legs of the horse. These chains are used to get the horse to lift it's legs higher, either because the chains are hurting the horse, or the horse is trying to step out of the chains to depending on the weight of the chains and the length of time they have been used. In September of 1978 - December of 1982 a study was done by Auburn University, called the Auburn study. 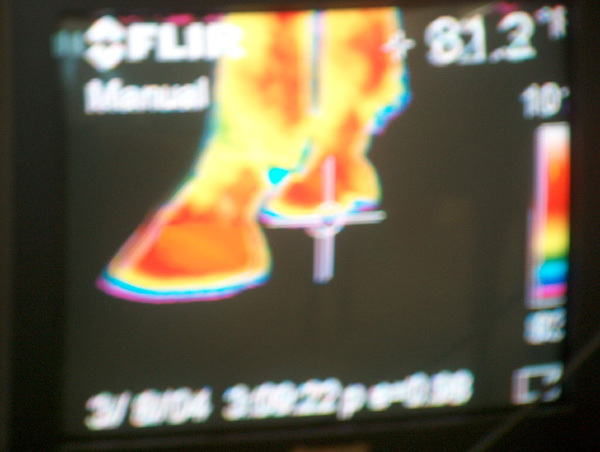 The Auburn study was done to test "Thermography in diagnosis of inflammatory processes in horses in response to various chemical and physical factors." "It took about 20 days in recovery to obtain normal thermal patterns." with chemicals on the pastern and exercised in chains." developed raw, bleeding lesions on the scared pasterns when exercised in action devices and lubricant. 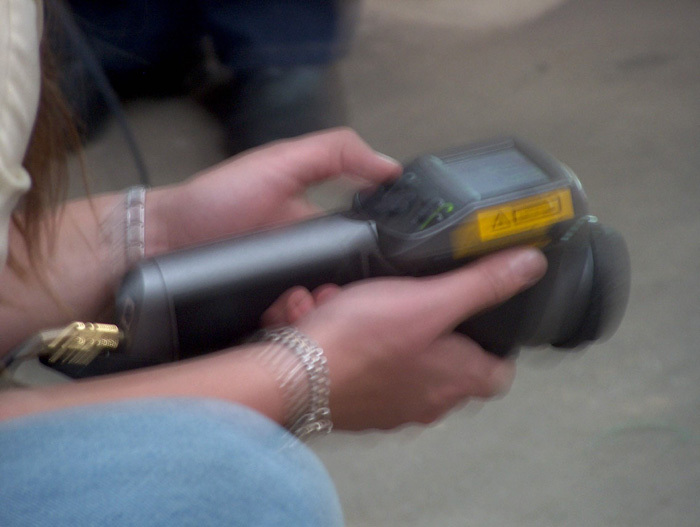 action devices and the drop in pressure readings occurred." 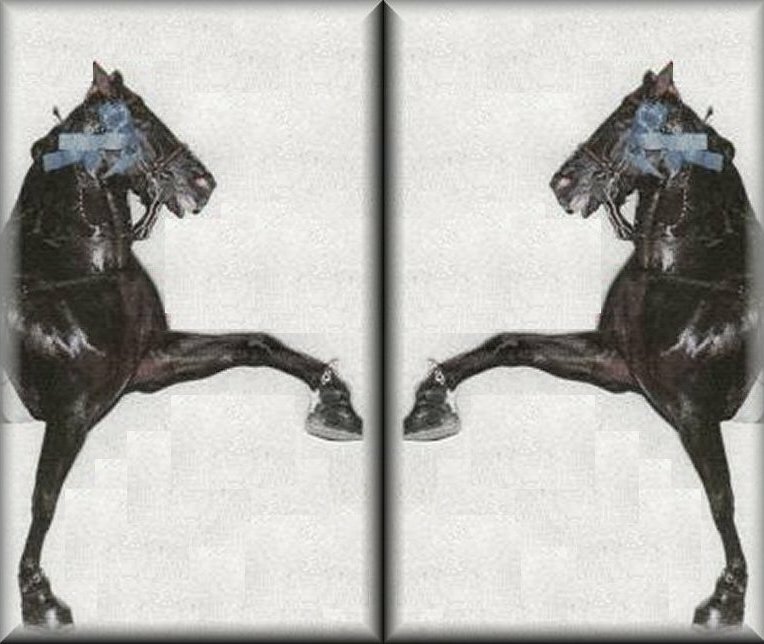 altered gaits visible to observers." 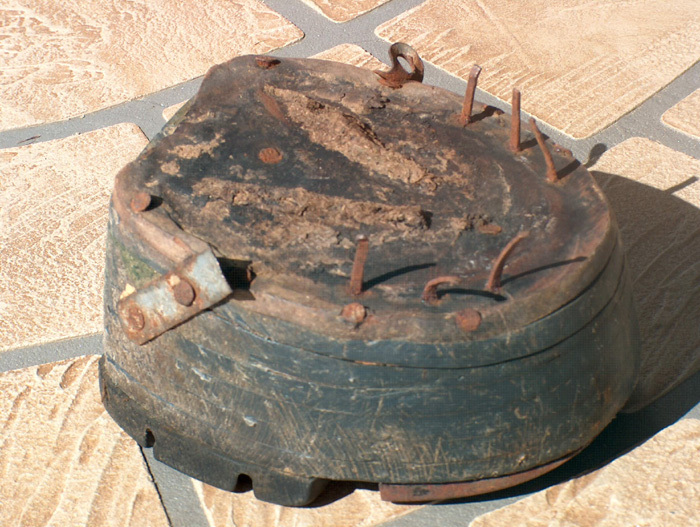 We We have yet to carry out the formal steps to determine the effects of built-up pads on Tennessee Walking Horses. 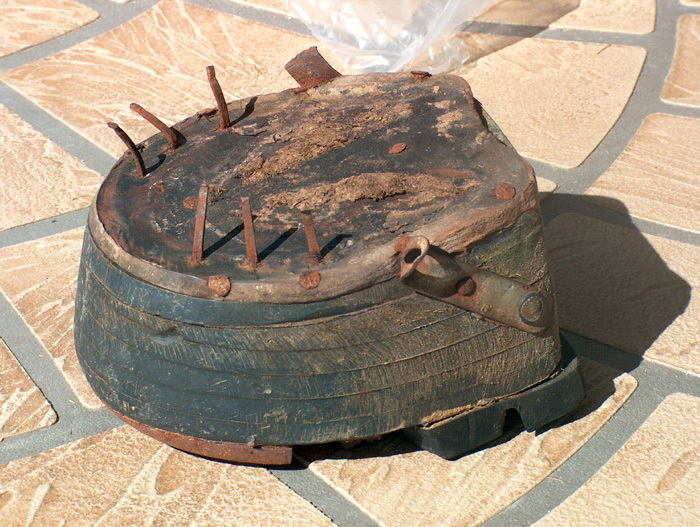 Over the years, however, we have experienced what the group considers a high rate of thrush in the horses we have shod with pads and used in tests. Although it is not readily apparent on clinical observation we have observed with thermovision varying degrees of abnormal inflammation on the posterior aspect of the metacarpal area where the flexor bundle is located. This usually occurs the day after a horse has been freshly shod, whether or not he is exercised daily, and lasts from a few days to two weeks. We Attached are some questions we asked of our farrier and four clinic veterinarians who devote their professional time almost exclusively to equines. 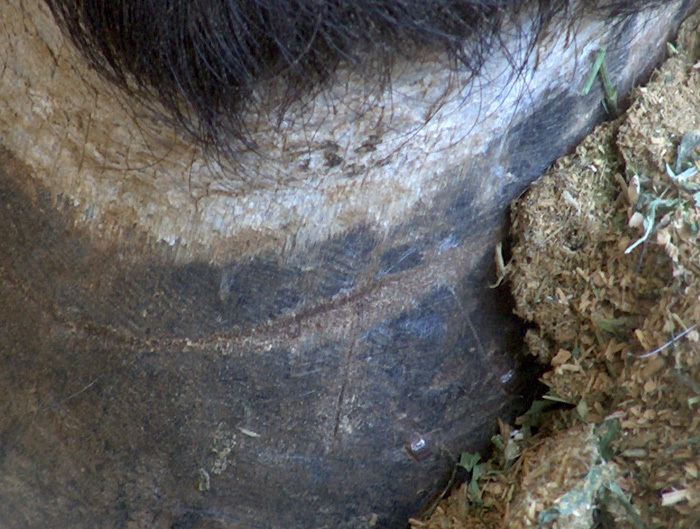 They all answered `yes' to the first two questions and suggested sheared heels, quarter cracks, and laminitis as other abnormalities of the forefeet of Tennessee Walking Horses shod with conventional pads. They all answered `yes' to the fourth question, giving their reason that they could not adequately examine the feet unless the sole was exposed.